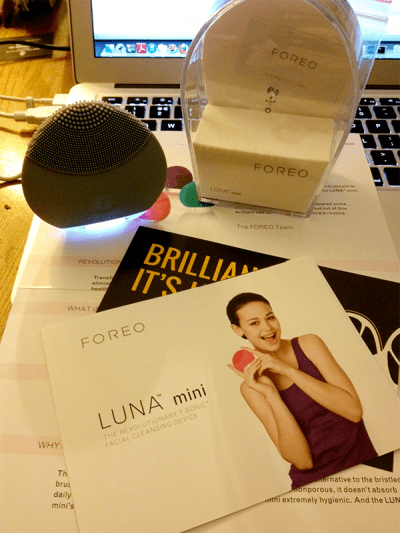 I sometimes, though choosily, take part in Bzzagent campaigns for products but haven’t for quite a while until I was offered the chance to trial and review the Foreo Luna Mini. Vaunted as a ‘landmark skincare device’ it’s similar in ethos to the Clarisonic in outcome however it’s built and works differently. Apparently useful for problem skin, the Luna Mini is made entirely from high grade, smooth, silicone, it is fully waterproof and ergonomic in shape. It supposedly works by chanelling ‘T-Sonic pulsations’ to provide a deep and gentle cleanse by unclogging pores of dirt, oil and makeup residue as well as dead skin cells. The nodules really interests me as, unlike the rougher Clarisonic brush, it has different sized nodules for varied touch points and the silicone means nasty bacteria won’t build up in it….and thus undoing the goodness of the pulsations. The unit has literally just landed (pictured in ‘cool grey’) in a very neat little box with a two year guarantee card and its USB charger which, when fully charged, means it should last for 300 sessions. It came with discount cards for anyone interested (just mail me) which provides for 35% off the £99 retail (currently sold in Harvey Nichols). For my next post I shall report on how it works and first results. if you still have the discount card for this product, I’d be really grateful to have this as I’m itching to try it. Sure, hit the “contact me” button and I’ll email you one.